Back in July I told you about a dual-mode CDMA and GSM Android running tablet, Enigma made by 6Degree Communications. They tried to make something different from others at a reasonable price. I am sure that they are one of the very few companies in the world who have even thought about a tablet that will support both GSM and CDMA network. But now it’s true. Yesterday they release this Android 2.2 cheap 7-inch tablet on Bangladeshi market with one and only CDMA cellular service provider of the country, Citycell. Citycell have the fastest broadband mobile internet network in Bangladesh. So people who are looking for a cheap tablet there, 6Degree Enigma is a great choice. Read the full PR after the break. 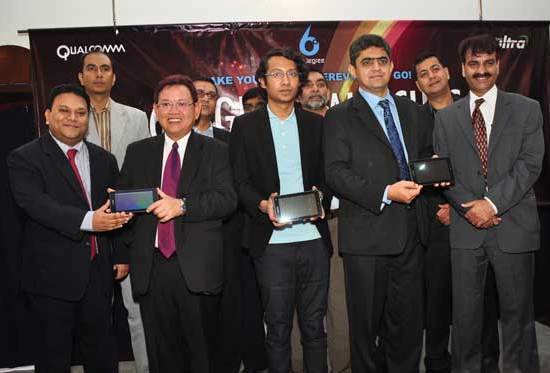 6Degree Communications Ltd. announced the launch of Bangladesh’s first dual mode Android Tablet device, Enigma, in collaboration with Citycell on November 18, 2011. It is powered by Qualcomm’s Snapdragon S1 mobile processor. The product delivers best-in-class mobile computing and internet experience and will be available from November 18, 2011 in the new, exclusive 6Degree concept store in Bashundhara City. Speaking on the occasion, Mr. Abu Hasan Aunik, Chairman and CEO, 6Degree said, "We are pleased to introduce a breakthrough convergence device which combines the functionalities of both mobile phones and tablets to offer cutting edge services that will appeal to generation-Y. This device promises to be a game-changer with its rich looks and advanced features; it provides a rich internet experience in an ultra portable form factor. With Enigma, we are well-positioned to compete with the country's leading brands." In a message emphasizing the collaboration between Citycell and 6Degree Communications Ltd., Mr. Kafil H. S. Muyeed, Chief Marketing Officer of Citycell said, "Combination of the Enigma tab and Citycell's Zoom Ultra connection will offer enhanced user experience in term of browsing speed and content for mobile broadband users across the country." Further in the unveiling event, Mr. David Lee, Chief Operating Officer of Citycell termed this launch as an innovative offer to better meet customers’ changing needs. "We congratulate 6Degrees and Citycell on the launch of Enigma, the first dual-mode Android tablet in Bangladesh," said Dr. Sandeep Sibal, Country Manager and VP of Business Development for Qualcomm India and South Asia. "Powered by Qualcomm's Snapdragon S1 mobile processor, Enigma combines superior processing power with high performance graphics and crystal clear HD voice, as well as offers fast mobile broadband speeds that utilize best-in-class EV-DO network in Bangladesh. Qualcomm is committed to bringing world-class, yet affordable, mobile broadband computing experiences to the people of Bangladesh." Enigma's 7 inch capacitive, multi-gesture touch screen display renders an intuitive experience to consumers. With its Android OS 2.2 and other utility applications like documents to go, combined with habitual functions like regular voice calls and SMS, Enigma is a convenient and easy substitute for laptops and mobile phones. 6Degree Communications is committed to addressing the need for affordable, always-on computing devices in the country and bringing outstanding devices that display cutting-edge technology, backed by a global leading innovator like Qualcomm, to the people of Bangladesh. This launch is a significant contribution towards achieving the key objectives of "Digital Bangladesh," that aims to take the power of broadband to the masses by encouraging the use of modern digital wireless technologies that provides access to information literally on one’s finger tips and on the go. Enigma aims to help achieve this and much more, towards empowering the people of Bangladesh. 6Degree is proud to consistently bring to market, exceptional devices for the consumers of Bangladesh.